I am native Portuguese speaker, but also communicate (Understand, Read, Write and Speak) pretty well in English. I can also communicate (Understand, Read and Speak) quite well in Spanish. In German I understand a few words and do basic conversations. 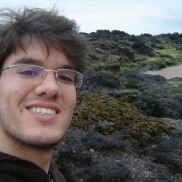 My name is Rui Machado, I'm 28 years and from Portugal. I am currently doing my PhD in Regenerative Medicine and Chronic Diseases, specifically linked to systems biology (computational side of investigation). I am an outgoing person, very shy at first, but when I feel comfortable with new friends, one could say you get a friend for life. Quiet, tidy and clean.